AMMONNEWS - Riots renewed in the southern governorate of Karak Wednesday evening with protesters clashing with anti-riot police and torched the old governor house. Ammon News correspondent in Karak Mohammad Khawaldeh reported that protesters set ablaze the old home of the governor, which is adjacent to the governorate building. Public Security Department (PSD) media center said that protesters placed burning tires in the abandoned governor home, adding that protesters used Molotov cocktail and improvised incendiary weapons against gendarmerie forces, who used tear gas to disperse crowds. 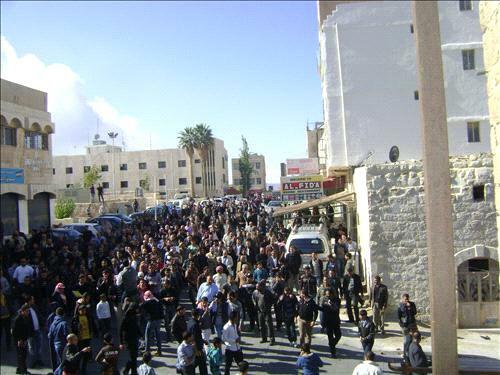 The protest in Karak witnessed harsh slogans against the government, and critical chants against King Abdullah II. The protest comes a day after Prime Minister Abdullah Ensour's government announced lifting subsidies on fuel derivatives, which caused a substantial hike in prices of gasoline, kerosene, diesel, and cooking gas.